Mouse anri Human Aurora -A kinase monoclonal antibody, clone 35C1 (MCA2249) used for the evaluation of Aurora A kinase expression in HeLa cells during mitosis by immunofluorescence microscopy, immunoprecipitation and western blotting. Aurora A localizes with and phosphorylates centrin in vitro and in cells. (A) Immunofluorescence confocal microscopy of HeLa cells demonstrates that Aurora A (green) and phospho-S170 centrin (red) both localize at mitotic spindle poles from prophase through metaphase. Phospho-centrin is greatly reduced in anaphase and telophase and Aurora A is greatly reduced by telophase. DNA was counterstained with DAPI (blue). Scale bar = 10 microns. (B) Western blots of whole cell lysates (WCL) from cycling and nocodazole-arrested mitotic cells show that centrin and Aurora A are present in asynchronous and synchronous cultures, with greater amounts of Aurora A in mitotic cells. Reciprocal immunoprecipitations (IPs) of mitotic cell lysates demonstrate an interaction between Aurora A and centrin during mitosis. 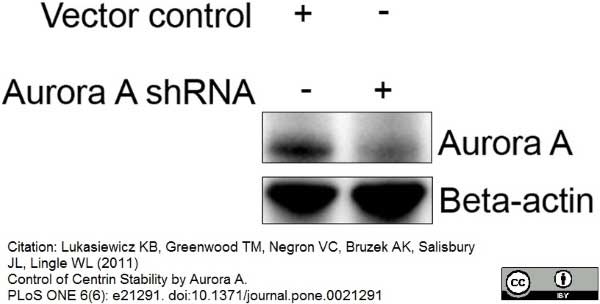 (C) In in vitro kinase assays with recombinant centrin incubated with recombinant Aurora A, centrin was phosphorylated only in the presence of ATP. Under conditions containing ATP, a shift in centrin is detected when Western blotted with a total centrin antibody (lower panel) and phospho-centrin is detected by the phospho-S170 centrin antibody (upper panel). Phospho-centrin is not detected under conditions lacking Aurora A and/or ATP. (D) In vitro kinase assays using endogenous Aurora A immunoprecipitated from nocodazole-arrested HeLa cells generated phospho-centrin only in the presence of ATP as demonstrated by Western blotting with the phospho-S170 centrin antibody. 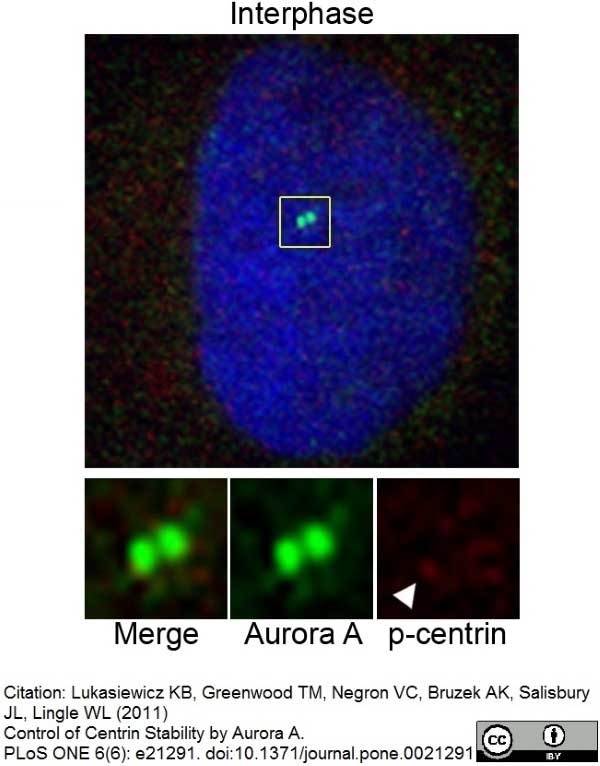 (E) Kinase-active Aurora A is required for phosphorylation of centrin at mitotic spindle poles. Cells that lack endogenous Aurora A but express shRNA-resistant GFP-WT Aurora A clearly exhibit phospho-S170 centrin (red) staining; while those that lack endogenous Aurora A and express GFP-kinase dead Aurora A exhibit a nearly complete loss of phospho-S170 centrin (red) staining at the mitotic spindle poles. White arrows denote the focal staining of gamma-tubulin (turquoise) at poles in the cell expressing WT Aurora A or kinase dead Aurora A (green). From: Lukasiewicz KB, Greenwood TM, Negron VC, Bruzek AK, Salisbury JL, Lingle WL (2011) Control of Centrin Stability by Aurora A. 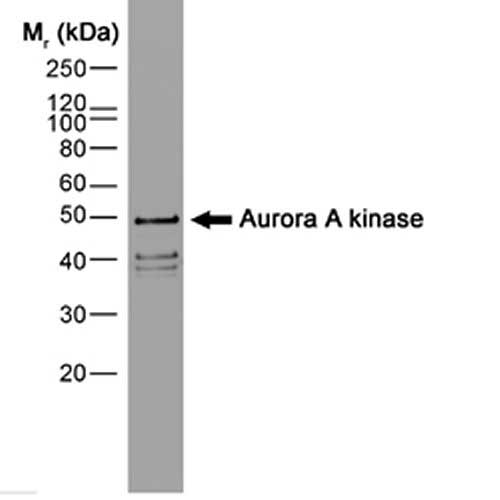 Mouse anri Human Aurora -A kinase monoclonal antibody, clone 35C1 (MCA2249) used for the evaluation of Aurora A kinase expression in HeLa cells during mitosis by western blotting. Centrin interacts with APC/C during mitosis. (A) Levels of Aurora A, centrin, and cyclin B were compared in Western blots of lysates of HeLa cells harvested at the indicated time points after synchronization by double thymidine/nocodazole block and release. Cyclin B degradation is used to indicate the onset of anaphase, while the beta-actin blot serves as a loading control. Aurora A and centrin levels drop to basal levels by 150 minutes post-release, while cyclin B is at basal levels by 120 minutes post-release. (B) Equal volumes of immunoprecipitations of lysates from cycling (C) or nocodazole arrested (N) HeLa cells performed with Cdc20 and centrin and Western blotted with the indicated antibodies demonstrate that centrin is pulled down with cdc20 only in nocodazole arrested cells along with Cdc16 and Cdc27. Cdc20 is pulled down with centrin in nocodazole arrested cells and to a slightly lesser extent in cycling cells. The antibody heavy chain and cdc20 were indicated with (grey triangle) and (dark triangle), respectively. (C) In lysates from asynchronously growing HeLa cells only non-phosphorylated centrin immunoprecipitates with cdc20. Cdc20 does not pull down phosphorylated centrin even though p-S170 centrin is abundant, as seen in the lysate-only lane. (D) HeLa Tet-On cells expressing various centrin mutants treated overnight with DMSO (D), ALLnL (A), leupeptin (L), MG132 (M), and ammonium chloride (N) and Western blotted with antibodies directed against total centrin reveal that DMSO, leupeptin, and ammonium chloride do not prevent centrin degradation, whereas ALLnL and MG132, the two proteasome inhibitors, do prevent degradation of wildtype and mutant forms of centrin. Lamin B loading controls are shown for each mutant cell line. (E) Lysates from HeLa Tet-On cells expressing S170A centrin treated with DMSO (D) or ALLnL (A) for 16 hours were Western blotted for centrin and beta-actin show significant degradation products in the presence of ALLnL but not DMSO. Additionally, when the boxed area of the centrin blot is over-exposed, 7 kDa laddering indicative of ubiquitination is evident (open triangle). Endogenous and HA-centrin are indicated with (light triangle) and (dark triangle), respectively. Mouse anti Human Aurora -A kinase monoclonal antibody, clone 35C1 (MCA2249) used for the evaluation of Aurora A kinase expression in HeLa cells during mitosis by immunofluorescence microscopy. 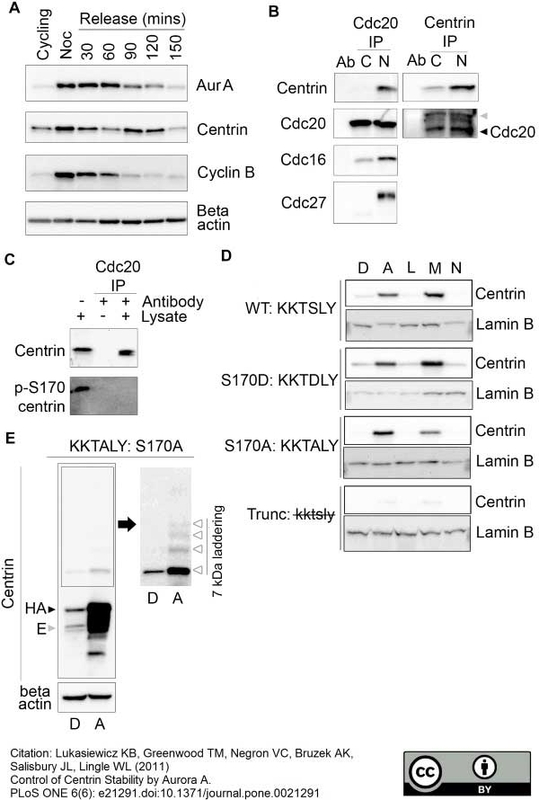 S170D-centrin drives centrosome amplification. 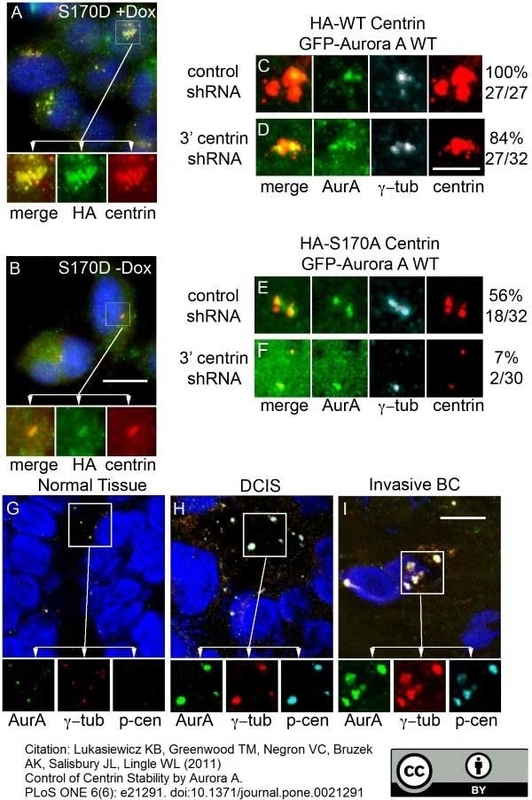 (A) Constant expression of S170D-centrin drives centrosome amplification in HeLa Tet-On S170D-centrin cells treated continuously with doxycycline. Cells were stained with an antibody against HA (green) and a polyclonal antibody against centrin (red). Scale bar = 10 microns. (B) Cells that were not induced with doxycycline have normal centrosomes. Cells were stained as in panel (A). Scale bar = 10 microns. (C–F) HeLa Tet-On HA-WT-centrin or HA-S170A-centrin cells transfected with GFP-WT Aurora A and allowed to recover for 24 hours. Cells were then transfected with control shRNA or centrin shRNA and treated with doxycycline to induce HA-centrin expression. Aurora A expression was noted by GFP positivity and cells were stained with centrin (red) and gamma-tubulin (turquoise). A vector control Western blot is shown in Figure S3. Cells over-expressing HA-wildtype centrin in the presence of endogenous centrin have large, numerous centrosomes (C) in virtually all cells. Cells over-expressing HA-wildtype centrin in the absence of endogenous centrin have large, numerous centrosomes (D) in most cells. Conversely cells over-expressing HA-S170A centrin in the presence of endogenous centrin occasionally have slightly enlarged centrosomes (E) and cells over-expressing HA-S170A centrin in the absence of endogenous centrin rarely have slightly enlarged centrosomes (F). GFP positive cells were analyzed for centrosome amplification based on increased size and/or number of centrosomes. The number and percentage of cells with centrosome amplification is presented below each panel. Scale bar = 2.5 microns. (G–I) Frozen breast tissue including normal adjacent breast (G), ductal carcinoma in situ (H) and invasive breast cancers (I) were stained with antibodies directed against Aurora A (green), p-S170 centrin (turquoise), and gamma-tubulin (red). Cells were stained with DAPI to mark the DNA. Scale bar = 10 microns. Mouse anti Human Aurora -A kinase monoclonal antibody, clone 35C1 (MCA2249) used for the evaluation of Aurora A kinase expression in HeLa cells during mitosis by western blotting. Aurora A knock down in HeLa cells. HeLa cells were transfected with Aurora A shRNA and whole cell lysates were harvested 24 hours after transfection. Whole cell lysates were separated by SDS-PAGE and blotted with the indicated antibodies. Asynchronously cycling HeLa cells were fixed, permeabilized, and processed for immunofluorescence as described in the Material and Methods section. This image shows an interphase HeLa cell exhibiting faint p-S170 centrin (red, denoted with white arrowhead) co-localizing with Aurora A (green) staining at the centrosome. HeLa cells were processed for immunofluorescence as described in the Material and Methods section. Aurora A was detected with an anti-Aurora A antibody (green) and DNA was counterstained with DAPI (blue). An interphase cell is shown on the left side and an early prophase cell on the right side of the image. Note that Aurora A is much more abundant in the early prophase cell. Scale bar = 10 microns. Mouse anri Human Aurora -A kinase monoclonal antibody, clone 35C1 recognizes human Aurora-A kinase also known as Aurora 2, breast tumor-amplified kinase and serine/threonine-protein kinase 6 or 15. Aurora kinase A is member of the Ser/Thr protein kinase family containing a single protein kinase domain, has a molecular weight of ~46kDa and is involved in mitotic spindle assembly (Ducat et al. 2004). Aurora-A kinase is reported to be overexpressed in many epithelial cancers and is thought to play an important role in tumorigenesis (Katayama et al. 2003). 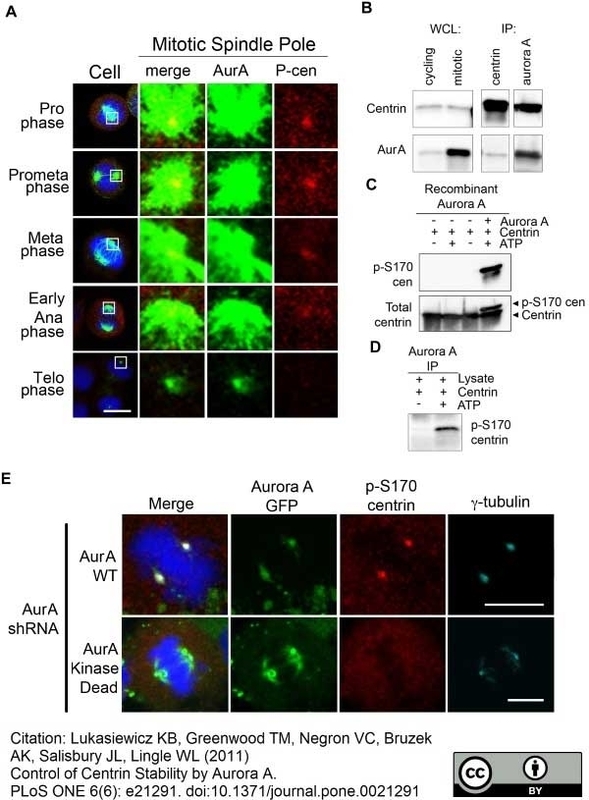 Aurora A kinase appears to facilitate phosphorylation of centrin and co-localizes with it at centrosomes with maximum expression through prophase to late metaphase (Lukasiewicz et al. 2011). Mouse anti human Aurora-A kinase, clone 35C1 recognizes an epitope within the non-catalytic N-terminal domain of Aurora-A. Clone 35C1 does not inhibit Aurora-A kinase activity (Cremet et al. 2003). Where this antibody has not been tested for use in a particular technique this does not necessarily exclude its use in such procedures. Suggested working dilutions are given as a guide only. It is recommended that the user titrates the antibody for use in their own systems using appropriate negative/positive controls. Human 293 and mouse LLC1 cell lines. MCA2249 detects a band of approximately 46kDa in human HeLa and mouse M-ICc12 cell lysates. Cremet, J.Y. et al. (2003) Preparation and characterization of a human aurora-A kinase monoclonal antibody. Mol Cell Biochem. 243 (1-2): 123-31. Hartsink-Segers SA et al. (2013) Inhibiting Polo-like kinase 1 causes growth reduction and apoptosis in pediatric acute lymphoblastic leukemia cells. Hartsink-Segers, S.A. et al. (2013) Aurora kinases in childhood acute leukemia: the promise of aurora B as therapeutic target. Lukasiewicz, K.B. et al. (2011) Control of centrin stability by Aurora A.
Douglas, P. et al. (2015) Phosphorylation of SAF-A/hnRNP-U Serine 59 by Polo-Like Kinase 1 Is Required for Mitosis. Mol Cell Biol. 35 (15): 2699-713.